Time can truly heal all—even in the music business. Typically an act can be a mega-hit for a solid decade and then fade into the darkness, never to be heard from again. Although rare, sometimes they can find a resurgence many years later by discovering a way back into the limelight. Today’s artist is one of those who found a new route thanks to a show that debuted this week. 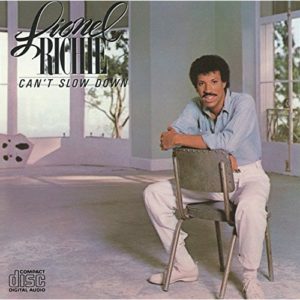 Lionel Richie was born in Tuskegee, Alabama in June of 1949. He practically grew up on the campus of Tuskegee University, the only school in the U.S. to have a National Historic designation from the National Park Service and also the home of World War II’s Tuskegee Airmen. After moving to Illinois for high school, Lionel would become a star tennis player, accepting a scholarship offer to play for Tuskegee University. After two years, he dropped out and was considering becoming a priest. Determining he wasn’t “priest material,” he turned to music and formed a succession of R&B groups in the mid-1960s. In 1968 Ritchie would join the Commodores as a singer and saxophonist. The group hit it big when signed to Motown Records as a support act for the Jackson 5. Remaining with the band through the ‘70s, Richie also started venturing out on the side, writing songs for other popular artists. Famously, he and Diana Ross contributed the title track for the 1981 film Endless Love, and that pushed him over the edge to try his hand at a solo career. Wasting little time, Richie put out his first album in 1982 to significant success. Three singles hit #1 on the charts and the album has sold over 5 million copies to date. Today I’m listening to his sophomore solo effort Can’t Slow Down released in October of 1983. Critics enjoyed the album of mostly ballads and cited the style suited Ritchie a bit better than the up-tempo, dance-pop themes of the Commodores. One critic even called it the “new Thriller” comparing him to Michael Jackson. The album reached #1 on the Billboard 200 and spent 59 consecutive weeks inside the Top 10 (including the entire calendar year of 1984). Richie would win the Grammy Award for Album of the Year in 1985 beating out heavyweight contenders like Bruce Springsteen’s Born in the U.S.A and Prince’s Purple Rain. In just two years, the album sold 15 million copies and currently has sold over 25 million worldwide. Probably safe to say everyone has at least heard of Lionel Richie at some point in their lives. His music is a very unique blend of pop, R&B, and soul. Vocally, his music is easily identifiable and uncommon in ballads of the era—his arrangements are fairly high quality. This is easily a record you could throw on in the background, sit on the porch and have a cup of tea and read a book. The hooks of a handful of tracks really stick in your head, and the track “All Night Long” is an absolute standard on the genre. While this may not be something I could select on a weekly basis, it’s a really solid change of pace from what I’m used to listening to. Lionel Richie, Katy Perry, and Luke Bryan have formed the judging panel of the rebooted American Idol which kicked off a couple days ago on ABC. While never completely fading out, Lionel has seemingly always found a way to stay in the fringe of Hollywood, and with this comeback, he’s returned to front and center. Can’t Slow Down is a nice throwback to an industry icon, and it’s only $4.99. At that price, I’d be buying music all night loooooong (all night)!